How would indictment against Netanyahu affect the outcome of this year's election? As the Attorney General and his staff deliberate on whether to accept police recommendations to indict Prime Minister Binyamin Netanyahu on corruption charges, it remains unclear how much of an impact an indictment against the incumbent premier would make on the outcome of this April’s Knesset election. A new poll, however, has surveyed Israelis on how their vote would change if Netanyahu is indicted prior to the April 9th election. 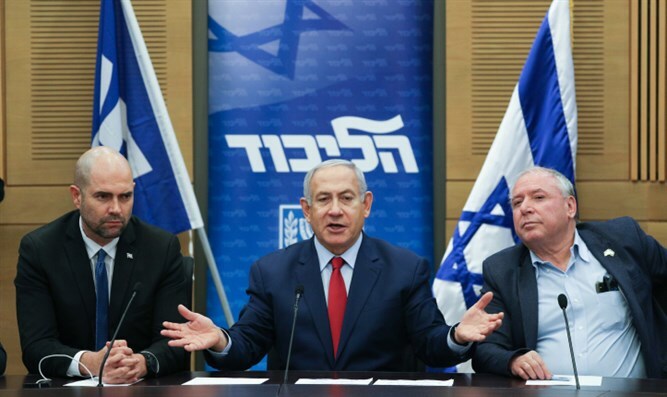 According to the survey, conducted by Midgam and published on Army Radio Tuesday, an indictment of the Prime Minister would cost the Likud four mandates, and would result in a net loss of three seats for the current coalition partners. Netanyahu, who is seeking a fifth term as Prime Minister – his fourth consecutive term – has been under investigation for years in three separate cases, known as Case 1000 (also known as the ‘Champagne Case’), Case 2000, and Case 4000 (also known as the ‘Bezeq Case’). If reelected, Netanyahu will become the longest serving premier this July. But police have recommended that Netanyahu face corruption and breach of trust charges in the three cases, which relate to allegations Netanyahu and his family received cash, champagne, cigars, jewelry and other pricey gifts from a businessman in exchange for political favors (Case 1000); claims Netanyahu traded favors with a newspaper mogul in exchange for favorable coverage (Case 2000); and allegations the Prime Minister advanced regulatory changes favorable to the Bezeq telecommunications company in exchange for favorable coverage on a media outlet owned by Bezeq’s largest shareholder (Case 4000). Netanyahu has denied the allegations, and accused the left and many in the media of putting "brutal and inhuman pressure" on Attorney General Avichai Mandelblit to indict the Prime Minister, in a bid to ‘steal the election’. While previous polling has shown that an indictment would have little to no effect on the outcome of the election, the new Midgam survey shows that if Netanyahu is indicted prior to the election, it would cost the Likud four seats. Nevertheless, the Likud would remain by far the largest party in the Knesset, with Netanyahu poised to secure a fifth term as premier. If no indictment is filed, the Likud is projected to win 29 seats, with Yesh Atid and the new Israel Resilience Party (Hosen Yisrael), established by former IDF Chief of Staff Benny Gantz, tied for second at 13 apiece. The Labor party, which recently ended its partnership with Hatnuah (the two had run together on the Zionist Union list in 2015), would fall to just nine seats, while Hatnuah would fail to clear the 3.25% electoral threshold. The predominantly Arab Joint List party would win six seats, while the breakaway Ta’al faction, led by Ahmed Tibi would also win six mandates, leaving the overall Arab representation in the Knesset virtually unchanged. If new elections were held today, the far-left Meretz faction would win five seats, the same number it won in 2015. Former Yisrael Beytenu MK Orly Levy’s Gesher party would win five seats, while Finance Minister Moshe Kahlon’s Kulanu would plummet from 10 mandates to just five. Among the haredi parties, the Shas faction would fall from seven seats to six, while the United Torah Judaism party would rise from six to seven. Yisrael Beytenu would win five seats – the same number it has held since MK Orly Levy broke away in 2016, but one less than the six it won in 2015. The Jewish Home party, which has struggled to clear the threshold since the departure of Naftali Bennett and Ayelet Shaked, would win four seats, while the New Right led by Bennett and Shaked would win seven mandates. If Netanyahu were to be indicted prior to the election, however, the Likud would sink to 25 seats. Both Kulanu and Yisrael Beytenu would gain a mandate in this scenario, with each winning six seats instead of five. Yesh Atid and Hosen Yisrael would also gain a mandate in this scenario, winning 14 seats apiece instead of 13.